In 2005, Bob Helt purchased for testing an available electric fan kit meant to replace the stock Corvair engine fan. Given the significant amount of interest and debate in the Corvair community of the practicality of an electric fan, he was interested in finding out if such a system could work. Ken Hand and Frank Parker then instrumented two stock late models and ran tests both with the stock fan and the electric fan kit so they could see how well the electric fan worked compared to the factory system. I have put some of the posted graphs below, along with portions of the notes Ken posted to VirtualVairs and FastVairs. 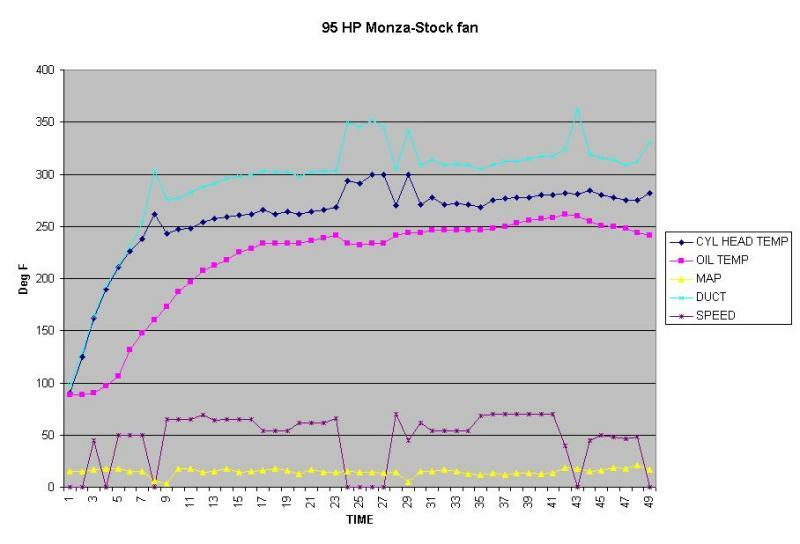 The stock fan base line tests were done on a 1965 Monza with a 110 PG. The second car was a 1965 Monza with a 95 PG. They measured outside air temp, oil temp, head temp and the lower heater plenum air temp, MAP and RPM. The oil temp was taken at the oil pressure switch sender hole; the MAP was taken from the balance tube; the head temp was taken from a probe that was bolted against the head boss where the overheat switch would mount, and held there with a washer and a bolt; and the air plenum temp was taken in the heater shroud and shielded from the exhaust manifold radiant heat by the shield that is there for the thermostat. On the initial tests we did about 45 MPH on the secondary roads for about 3 miles and then we did freeway for about 20 miles starting out at 65 MPH; then we hit some traffic and had to slow down a little but then were able to speed back up to 65 MPH and at the end just before we got off the freeway we sped up to 70 for about 2-3 miles. The numbers we got were very close to the 110 PG with about the same curve on temps. You will find the two engines very similar even though they were a 110 and a 95. I won't cite numbers because that will be in the graph from Frank. One of the common misconceptions is that the 110 is the worst of the two engines for heat because of the compression ratio. Well, I think we can put that theory to bed. With the electric fan finally installed we went out for our initial test and did the same thing as the previous test. It was about 45 on the secondary roads and once we got to the freeway we accelerated to the 65 MPH speed we did before. Let me back up a little and talk about the head temp only as a reference. If I recall correctly, with the stock fan the temp came up on a very linear scale and then stabilized and stayed at a decent number. When we got the electric fan installed and did the same tests the head temp came up very quickly and not linear at all. It was almost a vertical scale until the air doors opened and then the temp started to go a little more linear but the head temp never stopped climbing. We had to stop on the side of the road when the over heat light came on. We stopped and kept the engine at an idle and the temp came down very quickly. We started out again and then got into traffic in a construction zone and the temp was a bit high but stayed low enough to drive the car. When the traffic cleared a little we accelerated to a moderate speed and the engine temp kept going higher. We did not complete the same mileage with the electric fan because the engine would not stay cool at freeway speeds. We got off the freeway early and took all secondary roads back to Frank's house. We found that we could maintain 40 MPH and the temps would stabilize so we didn't have to stop and let the engine cool down. Once when we had clear road ahead we accelerated to 60 MPH and the engine soon overheated again so we stopped for a few minutes to let it cool then started back at our slow pace. We could hold 45 MPH for quite some time but the head temp would still start to climb. When I backed it down to 40 MPH the temp would very slowly go back down to the 40 MPH temps which were right at the high end of the spectrum. So we slowly made it back to Frank's house and proceeded to remove the electric fan kit and put all of the stock parts back on. The graphs below show the results clearly (thanks to Matt Nall for converting the graphs to JPEGs). Note that the temp scales are different between the stock and electric fans - the peaks for the stock fan are much lower than the electric. 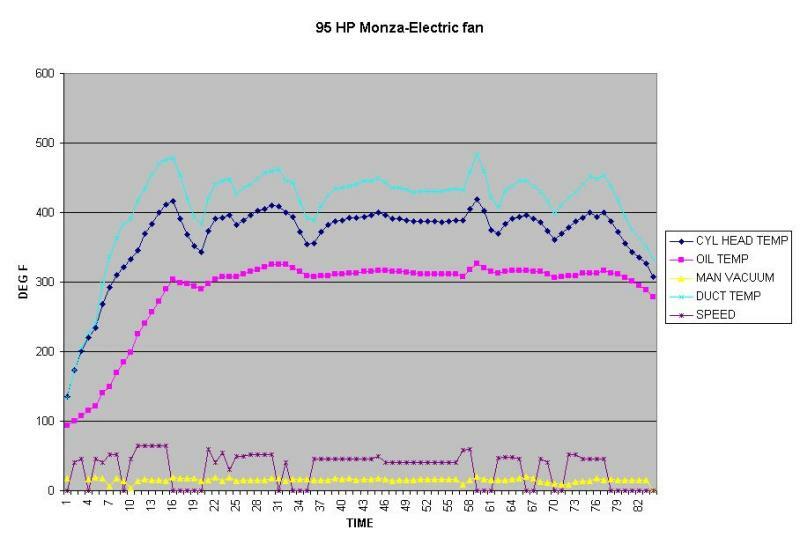 The time line description is below the graphs, the total time for the electric fan is much longer because they had to stop and let the engine cool. You can find the complete data in the FastVairs file section. 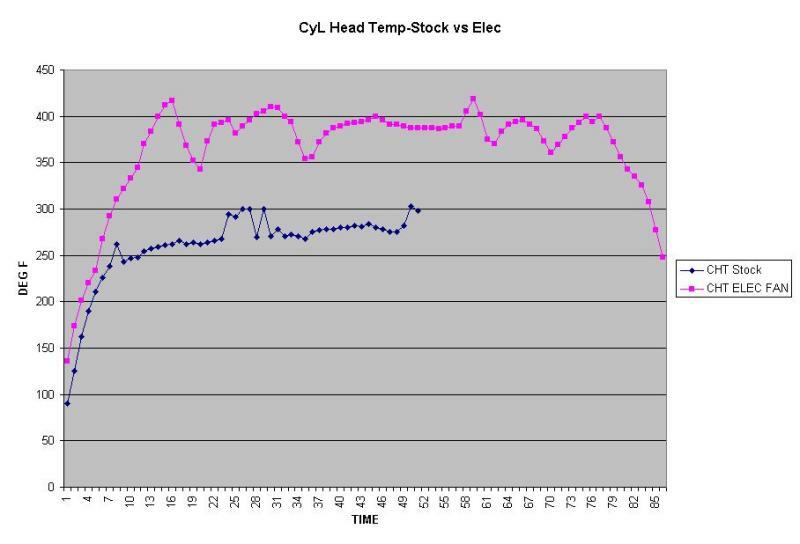 IMHO, the key sets of data to compare are cylinder head temps. The stock fan keeps the heads considerably cooler. Remember this is on a stock 95 tested at a peak speed of 65 MPH or so - the heat output of a performance engine at full throttle will be considerably higher. Note the temperature scale only goes to 400 degrees, peak head temp of 300. The temperature scale here is 600 degrees, peak head temp of over 400. 61-77 Return to shop at 45 mph, Oil light on at idle. Found thermostat blown up from overheating. Thanks to Bob, Ken, and Frank for setting up this test. Last update: 09 August 2008. Copyright Bryan Blackwell.